Metal maniacs, rejoice! 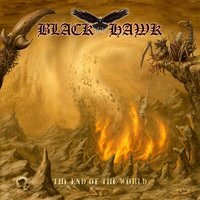 I'm proud to present to you: BLACK HAWK; signed via Pure Underground Records, hailing from the glory of Germany - performing Heavy Metal, on their 6th album entitled “The End Of The World” (released May 19th, 2017). Since formation in 1981; the quintet in question have 5 albums behind them, I'm introduced to their 6th album - “The End Of The World”. Incorporating a solid slab of hard-hitting Heavy Metal intricacies; the quartet arrange unique developments in this here release, and right off the earphones with the instrumental opening track “Return Of The Dragon” - we open this already explosive sound production with enlightening results. 11 tracks ranging at around 46:39, BLACK HAWK deliver a succulent tone that's infinitely true to the Heavy Metal name. “Streets Of Terror” showcases Wolfgang Tewes' complex guitar prowess, the solos are crunchy and screechy with mid-tempo complexities. In my humble opinion, if you have already listened to this record and haven't banged your head - there's something wrong with you. So far, this record is full of Heavy Metal clarities that spell greatness to your soul. Consisting of vocalist Udo Bethke who showcases an organic substance of clean, high-pitched velocity in which is balanced with somewhat melodic nasal. “Killing For Religion” provides a memorable and original songwriting pattern that has a fluid aesthetic on the NWOBHM (New Wave Of British Heavy Metal) influence. Powerhouse bassist Michael “Zottel” Wiekenberg flourishes with consistency to the harmonies that contribute with unprecedented attributes, “What A World” implements more sinister riffery from 2nd guitarist Günter Kruse as he performs with twin guitar dexterity and hooks which proficiently supply with speed and power and sufficient amounts of sturdy and swift rhythms. “Ruler Of The Dark” has similar characteristics and shows off drummer - Matthias Meßfeldt pummeling dominance, crushing his set with adroitness. The titular track “The End Of The World” excels with more aforementioned indifferences that stimulate me with more exciting elements; stemming with groovy relentlessness and salubriousness, manifesting with graceful hymns that keep me elevated. “Scream In The Night” begins with a low yell until it extends to a highly furious Heavy Metal scream that almost reminds me of MANOWAR's “Manowarriors” opening. The instrumentation is delightful and varies with pounding elegance, “Legacy Of Rock” was the catchiest on the record – sounding like a Hard Rock delicacy, fused with Heavy Metal underlying grooves and menacing madness. “Just Like In Paradise” lowered that tone providing more immense solos & detailed fulfillments, while “Dancing With My Demons” delivers a strong rocky groove & a catchy chorus. Closing the record with “Dragonride'17” (from the 2010 record of the same name) I simply had a blast with this one. Overall - highly recommend for fans of the “keep it true” motto in the sub-genre.